The Young Schema Questionnaire – Short form 3 (YSQ-S3) consists of 114 items and measures eighteen cognitive schemas. To establish the psychometric properties of the Romanian version of YSQ-S3, 160 participants were involved in the research. The instrument and its sub-scales have a very good reliability, the α Cronbach coefficients run between .68 and .96. To test the discriminative validity of this measure, the comparisons between the subjects with low scores and high scores were made both for the level of anxiety as a state and as a trait. The Romanian version of YSQ-S3 has a good discriminative validity. Based on YSQ-S3 scores it can be predicted the social phobia development and significant correlation was found between YSQ-S3 and automatic thoughts (ATQ) scores. Jeffrey Young (see Young et al., 2003) introduces the term of early maladaptive schemas and define them as being larger themes regarding the self and own relationships with the others which develop during childhood, become more complex during life time and are dysfunctional in a certain measure. His schema-focused therapy, based on the concept of cognitive schemas, is one of the most influential form of cognitive and behavioral therapies today. To evaluate the cognitive schemas, Young and his collaborators (see Young et al., 2003) developed the Schemas Questionnaire. The first forms of the questionnaire were YSQ- L2 (Young Schema Questionnaire – long form 2) and YSQ-S2 (Young Schema Questionnaire – short form 2). YSQ- L2 (Young Schema Questionnaire – long form 2) has 205 items and measures 16 of the maladaptive cognitive schemas (Ed, Ab, Ma, Si, Ds, Su, Fa, Di, Vh, Em, Sb, Ss, Ei, Us, Et, Is). It is preferred to be used in clinical purposes, because it reveals each schema and, as a consequence, offers more information. The short form YSQ – S2 consists of 75 items distributed as follows, on sub-scales: Ed, Ab, Ma, Si, Ds, Su, Fa, Di, Vh, Em, Sb, Ss, Ei, Us, Et, Is. It is frequently used in research because it can be filled in, in a shorter period of time. Punitiveness (PU) – the belief that people should be punished for making mistakes: items 8, 16, 24, 32, 40, 48, 56, 64, 72, 80, 88, 95, 102, 109. The main objective of this brief research report is to explore the psychometric properties of the Romanian version of the YSQ – S3. We focus on this instrument because it is the last version developed by Young and his group for research in the clinical field of schemas and schema-focused therapy. To establish the reliability of the instrument, 160 young and mature subjects were involved in the research (108 women and 52 men; mean age 30; between 20-50 years old). The Young Schema Questionnaire – Short form 3 (YSQ-S3) consists of 114 items and measures eighteen cognitive schemas (sub-scales; see the above description). Automatic Thoughts Questionnaire. The Automatic Thoughts Questionnaire (ATQ; Hollon and Kendall, 1980) is a 30-item inventory in which clients are asked to indicate, on a scale of 1 (not at all) to 5 (all the time), how frequently negative automatic thoughts such as ‘‘I’m worthless” have occurred in the past week. Scores on the ATQ can range from 30 to 150. The ATQ is a widely accepted scale and has been found to have good reliability (α Cronbach .96) and validity (e.g., significant correlation with Beck Depression Inventory and MMPI-D). Social Phobia Inventory consists of questions which evaluate fear, avoidance an physiological discomfort Each of 17 items are rated on 0-4 Lickert Scale, the full scale score range from 0 to 68. Test-retest reliability coefficients range from 0.78 to 0.89 and internal consistency α Cronbach coefficients take value between 0.82 – 0.94. For Romanian population an α Cronbach of 0.91 was obtained (Chereji, 2003). Spielberger State-Trait Anxiety Inventory (STAIX1 -state anxiety; STAIX2 -trait anxiety), which is considered to be a valid and reliable instrument for measuring both state (STAIX1) and trait (STAIX2) anxiety, was used in order to determine the level of situational and trait anxiety. The questionnaire application. For a clinical purpose, the therapist asks the client to fill in this questionnaire as homework, after the first or the second appointment. Some patients could recall severe traumas when they answer the items of the questionnaire and, due to this emotional interference, the filling in process is slower. The therapist can ask these patients to answer only a certain number of questions a week. Others will avoid the questionnaire, will not answer some questions, and they will do that because they try in such a way to avoid their own maladaptive schemas. If these patients will keep on avoiding the questionnaire, the therapist doesn’t insist, but he discusses the reasons of that. For a research purpose, the instrument can be administrated both individually and to a group. The questionnaire requires that the subjects should evaluate on a Likert scale of 6 points, how well each item describes him (1-completely untrue, 2-most of the times untrue for me, 3-in a certain measure rather true than untrue, 4-moderately true for me, 5-most of the times true for me, 6-it describes me perfectly). The items are grouped according to schemas. On the evaluation paper, a code formed by 2 figures occurs after each item, indicating the measured schema. The therapist can both register the total score or – in the clinical versions – the average of the score for each schema, and circle the items with the highest scores (5 or 6). The item with a high score will tell something about the patient, something that is worth to be taken into account. The therapist can afterwards see again the results, together with the patient, asking questions about those items with high scores. Those items usually reveal a schema which is important for the patient, and which will be discussed during therapy. So, the therapist will talk to the patient about that schema, then he will teach him the name of each schema, which is highly scored, and its significance. The results are based on the research version’s administration and scoring of the YSQ – S3. The instrument has a very good reliability, it was obtained a α Cronbach = .96. There were also calculated the α Cronbach coefficients for each sub-scale (Table 1), and they also proved a good reliability. Table 1. The α Cronbach Coefficients for sub-scales. The 160 subjects also filled in the scales STAIX1 and STAIX2 for measuring the anxiety. After establishing the standard for YSQ-S3 (see Table 4) the subjects who obtained average scores, for each sub-scale, were eliminated. Then, comparisons between the subjects with low scores and high scores were made both for the level of anxiety as a state and as a trait (see Table 2). Table 2. Results regarding the anxiety as a trait. * m1 and s.d.1 represents the average and the standard deviation of the sample group which registers low scores at the schemas questionnaire, and m2 and s.d.2 represents the average and the standard deviation of the sample group which registers high scores at the schemas questionnaire. For the anxiety as a state, there are not significant differences between the two groups, except for the schemas Us (t=2.55, p< .05) and Pu (t=2.31, p<.05). The persons who establish very high standards, sometimes unrealistic, being very critical with themselves (m2, s.d.2) register a state of anxiety higher than the persons who are the opposite (m2=48, s.d.2=2.98; m1=46.06, s.d.1 = 2.64). At the same time, the state of anxiety also increases when we are intolerant towards our own and others’ mistakes (m2= 48.07, s.d.= 3.90; m1= 45.95, s.d.=2.77). Unlike the state of anxiety, the level of the anxiety as a trait is strongly influenced by the strength of the belief in almost all the maladaptive cognitive schemas described by Young (see Table 2). Thus, the belief in the maladaptive cognitive schemas makes the difference between the anxious and non-anxious persons. The expectancy that the needs for security, safety, care, empathy, acceptance and respect will not be satisfied, will lead to the development of the anxiety as a trait. At the same time, the schema referring to the exaggerated fear for imminent catastrophes which might happen to us anytime and which we cannot prevent increases the level of anxiety. The belief that at least one of the persons involved in a relationship will not be able to live without the other one, to be happy without the other’s support, maintains a continuous fear of rejection. Self-blaming, the belief that she or he is not capable of anything good, that she or he will inevitably do wrong and fail, will be accompanied all the time by anxiety of performance. That can be also maintained by an exaggerated seeking for approval, recognition and attention of the others. When the spontaneous feelings, impulses and choices are prevented from being expressed, the person doesn’t allow herself or himself to be relaxed, living in a constant state of anxiety. The questionnaire proves a very good discriminative validity. Another instrument used in validating the YSQ-S3 questionnaire is The Social Phobia Inventory (SPIN), adapted for the Romanian population by Chereji (2003). The YSQ-S3 sub-scales prove a good predictive validity. Using the analysis of simple linear regression, we can conclude that the development of a social phobia can be predicted in a 28%, on the basis of the Sb sub-scale (p<.05), 24% on the basis of the Vh (p<.05) and Np sub-scales p<.05) respectively. A percentage of 22% of the social phobia’s variation could be explained by Ma (p<.05), 20% by Em (p<.05) schemas. The score resulted from the Fa (p<.05) can predict the occurrence of a social phobia in a percentage of 19% and the scores of the Si (p<.05), Ds (p<.05) and Di (p<.05), in a percentage of 17%. 13% of the social phobia’s variation could be predicted by the scores of the Ed (p<.05), Ab (p<.05) and As (p<.05) sub-scales. Lower percentages are registered for Is (p<.05) – 9%, Ei (p<.05) and Pu (p<.05) – 5%, Et (p<0.5)- 3%. These results support the predictive validity of the Romanian version of YSQ-S3. We obtain significant correlation between the YSQ-S3 sub-scales and ATQ (The Automatic Thoughts Questionnaire). The stronger the belief in the maladaptive schemas is, the more frequent the automatic thoughts are. The correlation coefficients that show a very good concurrent validity of this instrument are presented in the Table 3. Table 3. Coefficients of Corelation (r-Pearson) between YSQ-S3 and ATQ. Based on the collected data, Romanian norms of the questionnaire are proposed (see Table 4). Table 4. The Romanian norms of the YSQ-S3 questionnaire (N=160). Thus, the Young Schema Questionnaire – Short form 3 (YSQ-S3) consists of 114 items and measures eighteen cognitive schemas. To establish the psychometric properties of the Romanian version of YSQ-S3, 160 participants were involved in this brief research report. The instrument and its sub-scales proved having a very good reliability, the α Cronbach coefficients run between .68 and .96. The Romanian version of YSQ-S3 has a good discriminative validity differentiating between low scores and high scores for the levels of state and trait anxiety. Also, based on YSQ-S3 scores it can be predicted the social phobia development and significant correlation was found between YSQ-S3 and automatic thoughts (ATQ) scores. Anastasi, A. (1988). Psychological testing. New York: Macmillan Publishing Company. Chereji, S. (2003). Cognition and social phobia. Unpublished dissertation. Oradea. Development of an Automatic Thoughts Questionnaire. 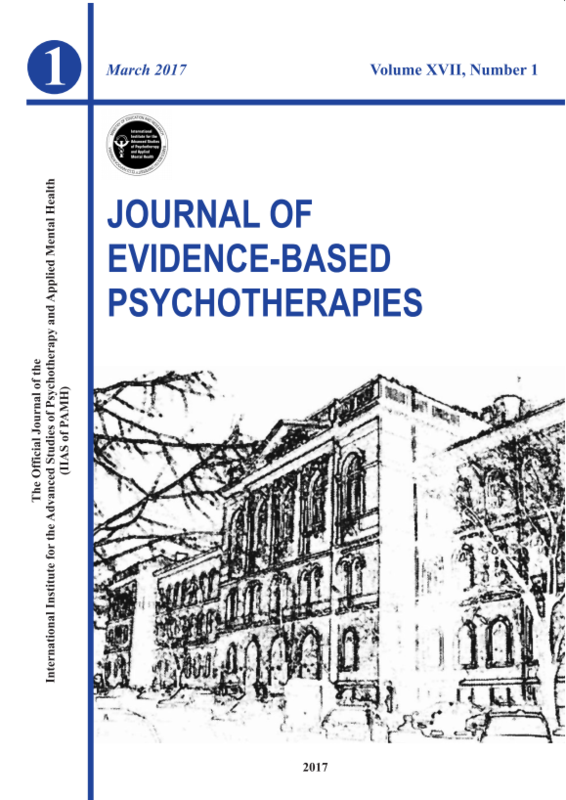 Cognitive Therapy and Research, 4, 383-395. Young, E.J., Klosko, S.J., & Weishaar, E.M. (2003). Schema Therapy. A Practitioner’s Guide. New York: The Guiford Press.